At our recent Spring Tasting we were pleased that there were many top selling reds. To pick out a few top sellers from Spain, we were thrilled that our latest organic wines from Dominio de Punctum were very popular. “Pablo Claro” Tempranillo 2014 is a particularly easy-drinking and great value wine – bring on the Barbecues! Also popular was Dominio de Punctum’s Tempranillo/Petit Verdot Roble 2012, a medium-bodied red wine; perfect for summer drinking. Bodegas Merayo in DO Bierzo have fantastic vineyards growing very old, bush-vine Mencia, which is a lovely grape and makes a distinctive and savoury wine. It was so popular we are now awaiting new stock! New arrival from Rioja, Ramon Bilbao’s Edición Limitada Crianza 2011 went down extremely well with all Tasters. It is an elegant and classy Crianza, which is made from hand-picked, hand-selected old vine Tempranillo, fermented in oak and aged for 14 months in French oak barrels. Also from Rioja, our ever-popular Medievo Seleccón Especial was another top seller. Dominio de Cair has a beautiful, state of the art bodega in the heart of Ribera del Duero and amazing vineyards of older vines, as usual their Cuvee Cair Roble current 2011 vintage sold very well too. It is an approachable Ribera del Duero red wine with great finesse. 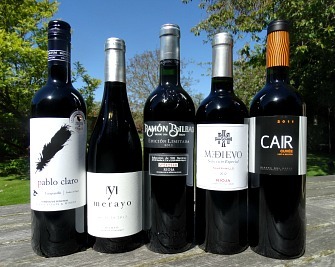 Check out The Wine Shop for more information about these wines.